A Toyota Corolla had to be lifted out of a Melrose pool after an afternoon dunk. For a reason still under investigation, officials say an elderly driver drove her car down the driveway, through the garage, out the back and into the pool. 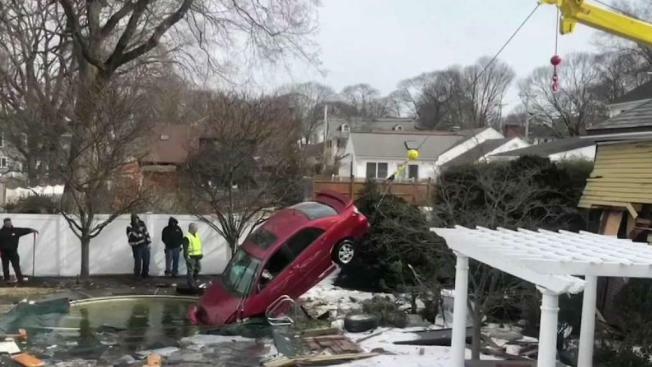 A motorist was hospitalized Wednesday after driving through a home and landing in a pool in Melrose, Massachusetts. The owner of the historic mansion on Upham Street, is now dealing with quite a mess. For a reason still under investigation, authorities say a driver, who is said to be elderly, was traveling on Geneva Road when she cut across Upham Street and somehow drove her car down the driveway, through the garage, out the back and into the pool. The owner of the home says no one was home when the incident happened, but he says he returned from the gym in Malden to see a hole in his house and a woman crawling out of his pool. Emergency crews responded after he called 911, and the driver, who was not immediately identified, had to be extricated before being taken to Massachusetts General Hospital with complaints of chest pain and feeling cold. Her condition is unknown. Melrose Fire Capt. Jon White says the pool cover may have saved the woman’s life. Firefighters captured images of damage at the home on Upham Street, as well as the car in the pool. While there is a lot of damage to his property, the owner says he is just glad everyone is okay. Crews had to bring in a crane Wednesday night to lift the car up out of the pool. It’s unclear if the crash happened because of driver error or a mechanical issue. It remains under investigation.